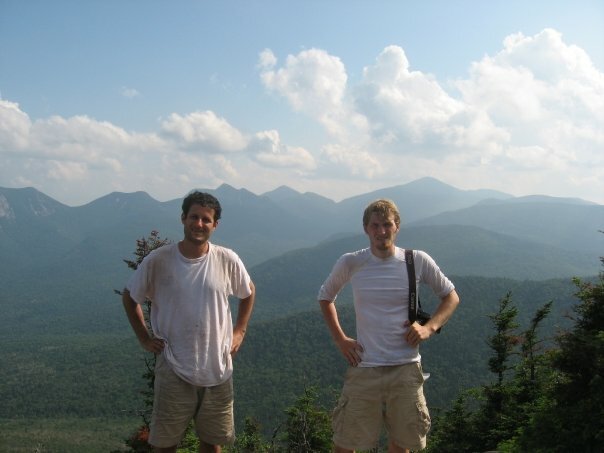 Founders Eric (right) and Jeff (left). The New Jersey 1K Club is a fledgling organization that seeks to bring attention to the many hiking opportunities and challenges that the Garden State offers. New Hampshire has the AMC 4000'ers; the Adirondacks has its 46'ers; the Catskills and its 3500 Club. And now . . . New Jersey's own peakbagging club: the 1K'ers. Sure, New Jersey's great if you like diners, traffic, and an ever-entertaining political system, but don't you ever have mountain envy? Ever wish you could climb a mountain around here and enjoy the progression of biomes? Ever wish you could break out the crampons and ice axe on Garden State mountains without worrying about wounding them? Ever wish you could have one of those cool peakbagger decals for New Jersey mountains like they have in our more vertically blessed states? Well, there's nothing we can do to make New Jersey's mountains any higher, and we don't have the decals yet, but at the least we can have a New Jersey peakbagging club. Yeah, our mountains are less than lofty, but we've got a lot of them and a surprising number don't even have trails to the tops. Some people collect porcelain dolls, some people collect cars, some people collect countries they've visited. Peakbagging is mountain collecting. It gets you off the highest, most notable summits in a range and forces you to go off the beaten-path; in New Jersey, chances are these are mountains practically nobody has ever heard of before. How can I become a NJ 1K'er? In order to become an official NJ 1K'er, you must climb all the peaks on our list, as well as register with us on our website. After each summit you have attained, log in and fill out the information regarding your ascent, which includes the summit name, date and optional trip reports and pictures. At the moment, we don't offer patches or decals to those who have completed the list but that will soon change. What are the qualifications for a 1K mountain? In order for a mountain to make the list, its summit must be at least 1,000 feet above sea level with a prominence of at least 200 feet. Please note that the current list is subject to change, as it may contain inaccuracies. If you have any suggestions for potential additions to the list, or you have spotted an error, please feel free to contact us.